At NAMM 2007 Novation unveiled Automap Universal, which they claim renders old school MIDI control obsolete, bringing an end to MIDI control nightmares. Automap Universal takes on where the original Automap left off, allowing users to instantly control absolutely any automatable plug-in, in any sequencer, automatically without ever having to refer to a manual or worry about complex MIDI data and assigning. Parameters can be 'learned' and saved at the touch of a button. 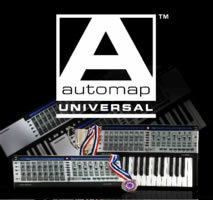 What's more, any ReMOTE SL owner can upgrade their unit to Automap Universal for free, by simply downloading the installer on the Novation website. Novation's original Automap technology took advanced MIDI controlling one giant leap forward because the SL finally allowed for automatic mapping of sequencer and instrument parameters as soon as supported applications booted up. All mixer parameters, transport controls and instruments appeared instantly on the faders, knobs, buttons and pads, with all parameters and track names being displayed clearly on the SLs two LCD displays. In order to work with all major applications, Automap relied upon the code within each of the independent sequencers. Automap Universal on the other hand, is a completely independent system that works in all applications, and as a result it works exactly the way you want it. With Automap Universal, any plug-in (VST, AU or RTAS), effects, instruments or otherwise, can be opened on any audio platform and be instantly controlled. The 'Automapped' plug-in appears as normal, only it now displays an Automap Universal logo, which glows when actively controlled. As soon as any plug-in is selected on the SL, parameters appear on the screens, laid out logically across all 64 assignable controls and displayed on the screens above. In addition to instantaneous and comprehensive control of all plug-ins, Automap Universal provides a simple yet powerful 'Learn' facility, allowing any active plug-in to be 'Automapped' in any way the user chooses; simply move a parameter on the plug-in and then move a control on the SL to auto-assign. Parameters can be easily renamed on the 'Automap-wrapped' plug-in GUI and the unique customised Automap template then saved for later use. Every detail of a session can be automatically mapped or learned quickly, with a minimum of fuss. With no more technical headaches to slow things down, creativity can finally flow freely.